How do I set the value for inline choice lists in a choice field? How to configure custom data names for selections in choice fields. You can set custom values for choice options in your choice fields (single or multi-choice) using a semicolon separator between label and value. The “label” is what the user sees when filling out a form, and the “value” is the what is included in the exported data and is pulled into calculation fields. 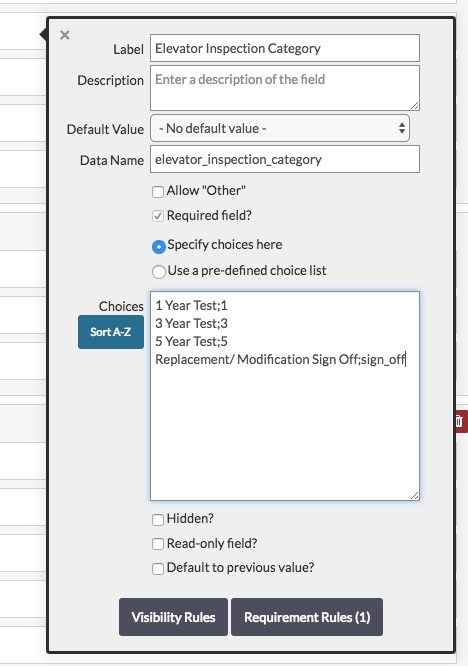 In the example image above, the user would see “1 Year Test” as a picklist option, The exported data or the value pulled into a calculation field will actually contain a value of “1”. If you wish to create a single choice list that can be referenced in multiple fields check out our predefined choice list page.